If it(judiciary) wishes to preserve its moral and institutional leverage, it must remain uncontaminated, independent and fierce”. Speaking at the Ram Nath Goenka Lecture, Justice Ranjan Gogoi, the second senior judge of Supreme Court, said “judiciary today is not a poor workman who blames his tools, but it is a workman with no tools. He was speaking in the context of the perceived “inefficiency” and “slow process” of justice administration. 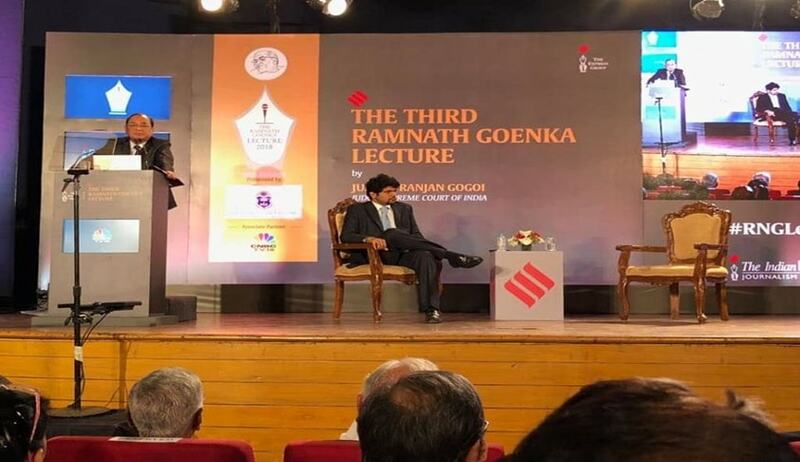 Justice Gogoi started the lecture recalling the valour of Ram Nath Goenka, who he described as someone who “spoke truth to power”. “His legacy gleams through the rich jurisprudence on the Freedom of Press that he was instrumental in moulding”. Delving on the philosophical aspects of the vision of justice, he said that justice was not a standalone concept but an amalgam of ideals like socialism, democracy, liberty, equality, and fraternity. They are not isolated silos because their underlying endeavor is to establish one the discipline of a just and inclusive society. The constitution had aspirational and operational aspects. The aspirational aspects dealt with idealism and operational aspects dealt with strange ground realities. The attempt of the judiciary is to bridge the gap between the two. Then, he discussed the 2015 Shreya Singhal judgment and remarked that it improved upon the jurisprudence on the independence of press and promote the constitutional percept of the plurality of though, diversity of opinion and ethos of democracy in the tech-age. However, striking a pessimistic note, he wondered whether the verdict has transformed ground realities. “On the ground, it is a decent into chaos. And it is worrisome on all counts when you sue the messenger or when you shoot the messenger, or when the messenger itself declines to deliver the message because of the fear psychosis”, he said. He recalled that an article in the Indian Express titled “How Democracy Dies” had mentioned that “independent judges and noisy journalists are democracy’s first line of defence”. Modifying that statement he said ,“sometimes independent journalists and noisy judges” are needed. He further stated that the NALSA judgment breathed new life into the equality principle. He also mentioned the National Anthem Judgment (Bijoe Emmanuel vs. State of Kerala), where it was observed “the true test of democracy is the ability of even an insignificant minority to find its identity under the country’s Constitution. Our tradition teaches tolerance, our constitution practises tolerance, let us not dilute it”. The judiciary had taken this principle forward in the Adi Saiva Sivacharaiyargal Nala Sangam judgment stating that even in religious matters constitutional legitimacy cannot be forgone. He remarked that constitutional morality should dictate terms instead of transient societal morality. He also added that there were “two Indias at conflict”. There is an India that believes that it is the New Order and there is an India that lives below a ridiculously drawn poverty line on daily wages in night shelters with no access to Court of Law. The ambivalence is intriguing". He also added that the court processes are at a trial. In the earlier part of the lecture, he had mentioned that he cannot recall the last time when the judicial branch made so much news. He said he can understand Arun Shourie when he wondered if the judiciary was not being an accessory to the resulting deterioration. While discussing the administration of justice on day to day basis which is perceived as “inefficient” and “slow process”, he said judiciary today is not a poor workman who blames his tools, but it is a workman with no tools. He bemoaned the fact that 67% of the prison population are undertrials, mostly belonging to the underprivileged class. As concluding remarks he said that if it(judiciary) wishes to preserve its moral and institutional leverage, it must remain uncontaminated, independent and fierce.